In my previous article specifically on style, How to define Style, I made an attempt at defining what style is. In this article let’s take a look at some of the things you can do to find your own personal style. You can identify your body type by going to this page and then follow the guidelines for your specific body type. You may also like to identify your vertical body type. Write down some words that describe your personality. How would you currently describe it? Do you feel that your style reflects your personality? Have a look at various different styles. Which do appeal to you most? 3. Which colors inspire you? Colours can also have a huge effect on your style and how you feel. Understand how certain colours make you feel. You may like to read my article on the psychology of color. If you don’t use much color in your current style, you may start to experiment a bit by adding bits of colors through accessories and see how these make you feel. Whenever you see others wearing clothes you admire or like, try to get a picture and paste it in a note or scrapbook or pin it on Pinterest. After a while, you will see a pattern developing of the kind of styles that you like. Take note of that and remind yourself about this style before going for the latest fashionable trend. Be honest. Which garments in your closet do you REALLY like. How many of the garments have you not worn for a long time. How many were ‘mistakes’. Again, write down what didn’t work. Which clothes make you HAPPY? Then donate or swap any items that you know don’t really work for you. They may be great pieces, but if they don’t suit YOU or your body type or create the silhouette you are after, you will not look stylish in them. Have a look at my wardrobe editing series and create a wardrobe that you love! I’m sure this happened to you. You see an absolutely wonderful piece of clothing at a rock bottom price. It fits your body, style personality and creates a silhouette you like. You try it on, but it’s just a little bit too short or too tight. You buy it anyway because the piece is so lovely and it’s cheap. This is a big mistake. Any clothing that does not fit you properly will never look good on you. So please beware of sales and only buy new clothes when you really adore them and they fit you properly (or that you can easily alter to fit you). If you felt wonderful on any particular day wearing a certain outfit, write it down. Or better even, take a picture. I have found that taking pictures of myself is a great help in recognising which outfits worked and looked good and which ones didn’t. This will help you identify your style and prevent you from making buying mistakes. True style defies fashion trends. Although it is nice to add some trendy pieces each season, you should only go for the trends that suit you. Try to wait for a trend that suits you and then buy several pieces. If through all of the above you got a clearer sense of what you like and what suits you, you need to determine if you have the basic essentials necessary for your particular style. These basics will be different for all of you. Go trhough your inspiration book and determine the absolutely necessary essentials for your style. Here is also what some style experts have to say about your wardrobe essentials. Once you have covered the basics of your style, look for some wonderful statement pieces that are truly unique for you. Try to be creative and mix both high and low end brands together. Create something unique! Accessories are easier to change and it’s also easier to be very creative with them. Invest in a good pair of shoes and choose the perfect hand bag for your style. If you understand your style well, it may not be necessary at all to have many shoes or handbags. Rather, you could focus on getting the perfect ones. One of these accessories may become part of your signature style. Something that uniquely defines you. Let me know if these tips work you for you! P.S. I created a FREE 5 day challenge for you that will allow you to find and define your style in 5 easy steps. Find out more and join the challenge for free here. Very useful post! Its great you’ve decided to give tips how to create personal style! Thank you so much for these tips. I just got a new job after being a stay at home mom and I have been stressing about what to wear. You have taken the edge off of my prep and I am so thankful. I realized I have a few things that work, so I don’t have to start over, and now I know what I need. Thank you! Great to hear that these tips were helpful to you Darien. Wishing you good luck with your new job and hope to connect with you again on the site! I know this is a long ago post, but I’m having fun flipping through the archives. I found style after I learned to paint. I started to understand color theory and suddenly I could mix and match my wardrobe, where before I could never understand how to do it. It’s a way of being a little bit artistic every morning. One of the most important things I do is I arrange my clothes by color so my (very small) closet is a rainbow. It helps me mix and match and also to know where I have a lot of clothes of a color (um, no more orange) or nothing in a color. Great that you are browsing old articles Lisa. It’s good that they are not forgotten! Yes, I do the same thing. As you say, it’s a great way to know which colors are still lacking! Thank you for such a lovely blog. 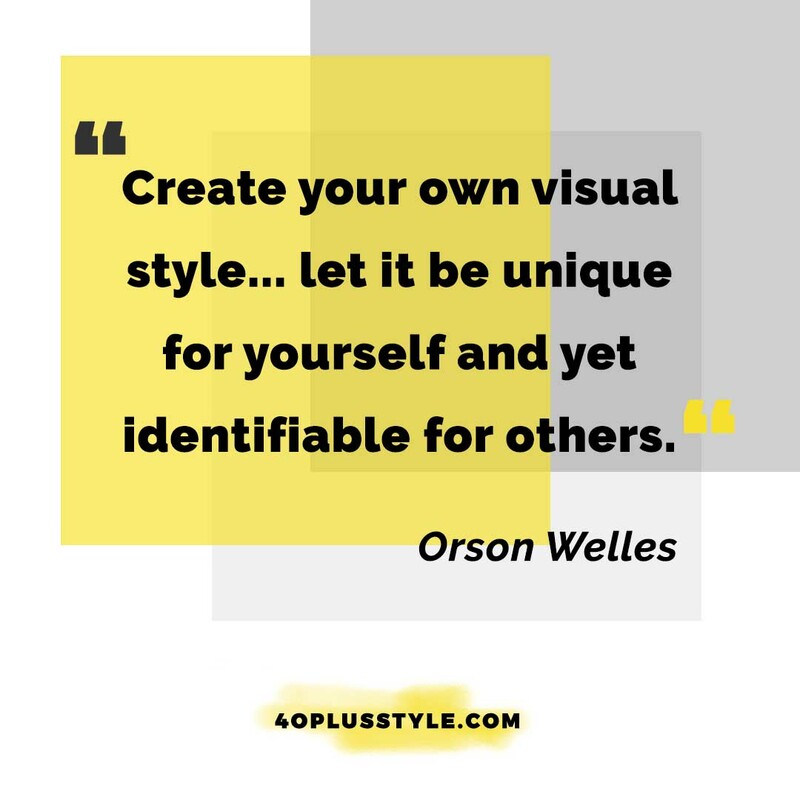 All the tips you’ve shared on finding your own style are particularly helpful – you’ve spurred me into action! Hello Sylvia. I am an older woman, but my fashion sense seems to go back to the 1970. (not hippy styles 🙂 Do you think is is all right for a woman of my age to wear long shirts and dresses? I love jeans and unusual shirts with sandals. I’d even wear sandals with my long skirts. This is the style I have loved for years. Am I too old for this??? Thank you for listening. No I don’t think so. I think it’s important to stay true to your style. The most important thing is to OWN the look and wear it with confidence! I have been following your tips and I couldn’t believe it when recently on holiday another lady came up to me and said that she and her husband loved my style and the way I dressed. I was so flattered. I wonder if this happens often to other women of our age? Wonderful to hear. I think other people can appreciate great style at any age! I think another important thing to look for in buying clothes is finding something that is comfortable. I have made the mistake of buying items that don’t feel good on. I end up never wearing them and end up just wasting money. You can still find plenty of pieces that are comfortable and stylish! Great steps on how to find my style. I had no idea that things like understanding my personality and knowing which colors inspire me will help me determine what my style of clothing is. I would think that having feedback from your peers would also be a good indicator of what looks good and what doesn’t. If you aren’t sure, you could just wear something and see if you get any compliments. I’ve read some other articles about this topic. but your article gave me better reasons and feel a nice sense of it. Next post: What is RSS and how can I use it?